It’s been an eventful few years for the band with the release of their latest album Songs for the Walking Wounded in 2016 and a European tour in celebration of the 20th anniversary of their 2nd album Grand Parade in 2017. 2018 had began with the band beginning work on the next album when, twenty five years after they gate crashed the UK Top 20 with their seminal hit ‘After All’, the track found a whole new audience following a classic television moment on the RTE/BBC production The Young Offenders. As the captives of a lovably psychotic Billy Murphy broke into the indie anthem on a Cork bus, so began the track’s whirlwind ascent of music charts both here and in the UK, culminating in a mid-week position of Number 1 on the i-Tunes download chart. A little more than 25 years to the day since the Franks played ‘After All’ on BBC’s flagship music show, Top of the Pops, the melodic hit once again reminded listeners that good tunes simply never go away. 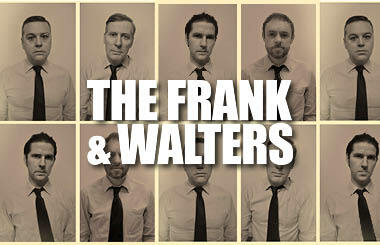 “The Frank and Walters create music as timeless and classic as their heroes The Beatles and Brian Wilson. But it’s their decency and kindness, in a music biz of sharks, that will always endear them to me” – Ken Sweeney.